Tom Cruise’s Mission Impossible: Rogue Nation not only is a genuinely fun summer spy movie, but it now serves as the cinematic antacid for anyone who made the mistake of seeing Josh Trank’s Fantastic Four. The 5th installment of the Mission: Impossible franchise has everything fans expect from it — great acting, twists and turns, exotic locations, humor, amazing stunts, etc. — and there isn’t one of those levels on which it disappoints. This time around, Ethan Hunt (Tom Cruise) and his IMF buddies are tracking the “anti-IMF” known as The Syndicate. There is only one problem: CIA Director Alan Hunley (Alec Baldwin) saw to it that the U.S. government officially shut down IMF. If Benji Dunn (Simon Pegg), William Brandt (Jeremy Renner), and Luther Stickell (Ving Rhames) help Ethan in his quest to bring to the “Rogue Nation,” then they will be committing an act of treason. 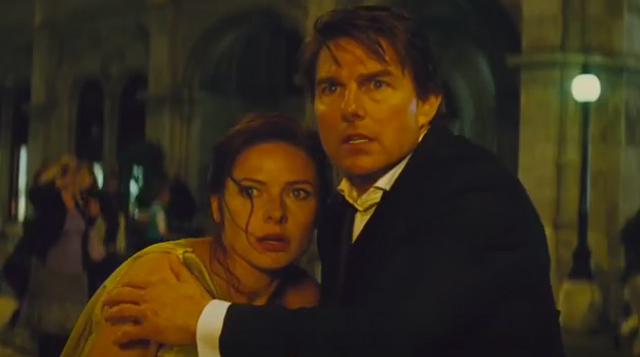 One aspect of Rogue Nation that helped guarantee its success was the ability of Rebecca Ferguson to nail the role of Ilsa Faust. She’s convincingly tough as nails, alluring, smart, cunning and athletic. She isn’t just a pretty woman in a fancy dress — she’s a take-no-prisoners, highly-trained intelligence agent (who may or may not have gone rogue). Rogue Nation’s villain, played Sean Harris, is also impressive. Solomon Lane is convincingly one step ahead of Ethan Hunt throughout the movie, and in general the only thing to really gripe about is his brief time wearing a black turtleneck. No matter how evil a character is, it’s always slightly harder to take him seriously if he looks like the old Mike Meyers Saturday Night Live skit “Sprockets”… Regardless, it says something about a movie when the worst a critic can do is to complain about clothes the villain wore for less than five minutes of screen time. If you like Tom Cruise movies, then see Mission Impossible: Rogue Nation. If you don’t like Tom Cruise and have just made up your mind that anything starring him is just “bad,” then take a moment to realize that your lack of objectivity is preventing you from seeing a really fun espionage flick. In short, this movie reviewer hopes that Tom Cruise has a least another two or three Mission: Impossible movies up his sleeve, because Rogue Nation was one of his best efforts yet. While Fast and the Furious has churned out more sequels in its lifetime than this franchise, there is never a sense of diminishing returns with any one of the M:I films. I certaingly hope it’s not the end. It’s a comforting feeling there are people who are probably telling their kids where they were when the first one came out, and it does’nt feel like Tom has lost a step or aged a day, which must have a boomerang fountain of youth feeling on his fans and moviegoers. I recently bought the first 4 films on BluRay (bargain price). It had been a while since I had seen any of them and I wanted to watch them before seeing the new film. This is a series that seems to get better with each film. As Zariusii said there are no diminishing returns and no collective groans when they announce a new one. I finally saw this film last night. Had a crazy 3 weeks and just didn’t have time. This was a fun film with some spectacular set pieces. I also thought the main villain had too little screen time but thought that worked with the character as he only appeared when he was interacting with one of the IMF agents or Ilse. This helped with the idea that he was elusive and they didn’t have a clue what he was up to. Thanks for circling back, Andrew. I’m glad you liked it! While many of you might guess that it would be Cruise losing his grip and falling, apparently that wasn’t the case.